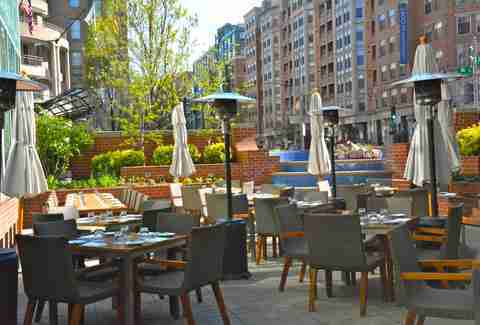 We’re in that precious window between Polar Vortex and hot-as-balls vortex, so seize the day Newsies-style and get yourself to DC’s best outdoor imbibing/ face-stuffing atmospheres. 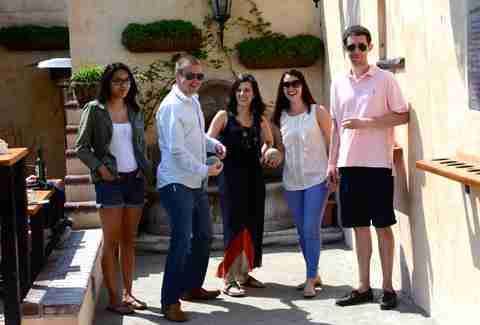 Think bocce, punch bowls, and grill borrowing. 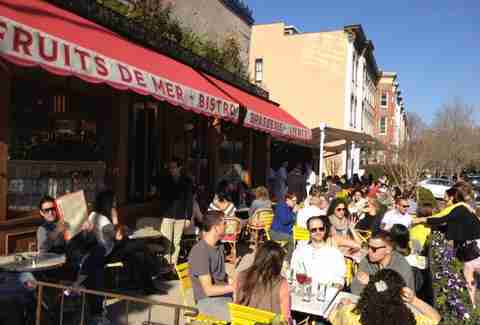 Here’s a 'hood-by-'hood guide on where to soak up some sun AND calories. 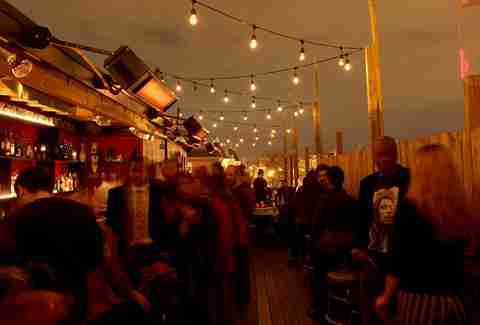 Think The Reef used to have the best roof deck in the city? Well duh, the view’s the same, but Roofers Union is a MAJOR upgrade. 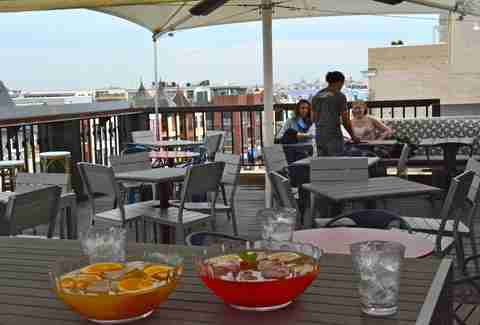 Start with one (or both) brightly colored tropical punches available on the roof only. Then, admire the view while discussing important topics like gentrification in between bites of andouille corndogs and beer brats from acclaimed Chef Marjorie-Meek Bradley. 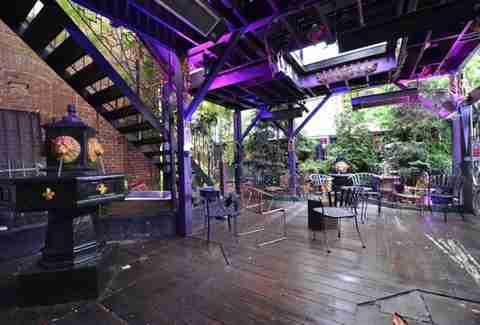 The Le Dip patio straight up transports you to Paris. You’re at a sidewalk café on Boulevard St. Germain, only without the pressure to produce French words. Given the amount of cool points anointed to those who nab a patio seat, you’ll have to plan WAY ahead with a reservation. Hopefully you’re not afraid of commitment. Or foie gras parfaits, because that’s what you’ll be eating. LMW takes the H Street title because they’ll let you use their grills as if they’re your own -- as long as you reserve the space for a private party and pay $20 for propane. 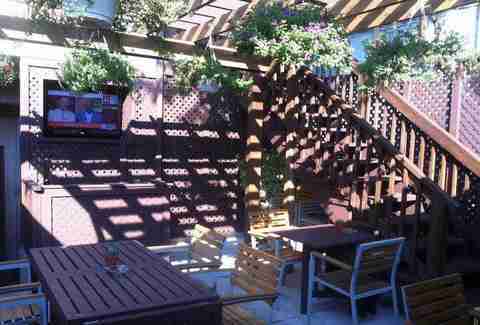 Beyond this big bonus, LMW put some elbow grease into beautifying their two patios. We’re talking antique fountains and 30-foot black bamboo. Since they don’t have food, you can bring in your favorite snacks or hold out for one of their crawfish boils. 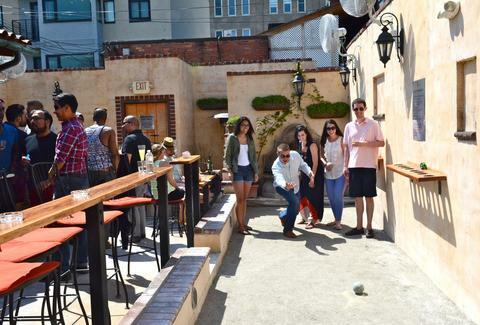 It’s all about dogs, burgers, and bocce on the Vinoteca plaza. Perfect Summertime picks include Who Dat Doggy: a boudin pork dog with grilled red onions and remoulade, and the Holy Mother of Pork Burger topped with Gruyere, fig, and bacon jam. There’s also a host of new Spring cocktails to try on the plaza in between games of bocce. You can lawn bowl Wed-Fri from 5pm-close, and Sat-Sun 11am-close. While you were in hibernation this Winter, the roof of the Donovan House Hotel got even more roof-tastic. You can now get Asian tacos and other street food from Zentan’s Chef Jennifer Nguyen, paired with equally exotic cocktails like the Tokyo Gimlet, made with your choice of booze and house-made yuzu-lime cordial. Just remember, no lifeguard on duty. 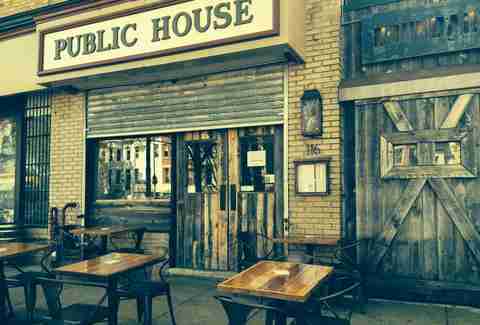 Head here after work Tues-Thurs (5:30-7:30pm) and plop down on the partially enclosed patio for $3 PBRs and half price "Royal with Cheese" burgers -- 6oz natural beef burgers with Gruyere cheese, bread & butter pickles, smoked bacon, and special sauce on a sesame seed bun. The CB patio is a solid pick at other times too, thanks to the restaurant’s arsenal of classic and original cocktails and German beers on draft. You can eat breakfast, lunch, or dinner on the BDT terrace that also serves as the restaurant’s herb garden. Those who play well with others should sit at the 12-seat communal table because it’s carved from a 50,000 year-old slab of an ancient Kauri tree. While you’re there, drink something botanical like the Ramos Gin Fizz, a New Orleans classic made with Bombay Dry Gin, fresh lemon juice, fresh lime juice, simple syrup, half and half, egg white, orange flower water, and club soda. The Poste patio is always bumping, and never lets you down when it comes to people watching. The playful patio menu has a section called "Fun Stuff", where you’ll find dishes like a chicken liver parfait or a crazy-good pickle plate, but you can also get old standbys like the onion soup burger, chorizo mussels, beer clams, and truffle frites. Sip on a seasonal gin and tonic or three. Swing by this neighborhood gem that’s a coffeehouse, diner, and bar. 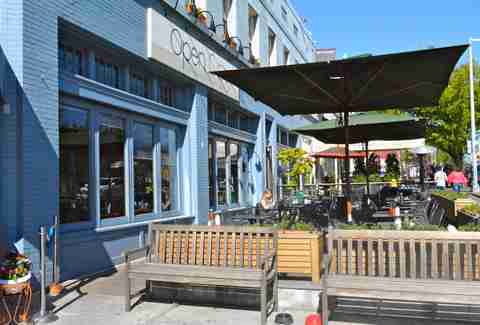 It’s by the same folks who brought us The Coupe, Tryst, and The Diner, only the patio at Open City slays it. They have a special set of "Patio Sippers" to enjoy with the sun on your shoulders, like the Mexican Radio with cucumber, pineapple juice, mezcal, simple syrup, and soda. There are plenty of opportunities to snag a coveted seat because they’re open 6am ‘til close. 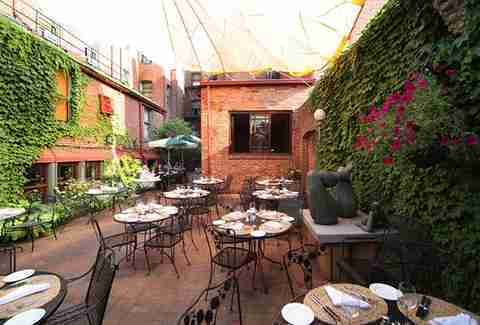 This charming courtyard will score you big points on a date, so make sure you play this outdoor dining card at just the right time. It’s cozy in a secret-garden sort of way and Tabard Inn is no stranger to slinging impressive cocktails. So go ahead and gaze at each other over Sazeracs or Chorizo Manhattans because yea, those exist. 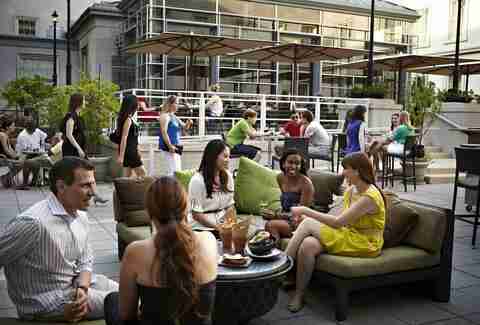 Tabard serves light fare on the patio every day starting at 4:30pm. Your laid-back outdoor option has arrived. If the martini-sipping, suit-wearing experience of some of these other spots makes you wince, just head to Red Derby where $10 or less will buy you a beer and shot combo and a good time. Oh, and in case you’re wondering: mac and cheese wedges DO taste better outside. 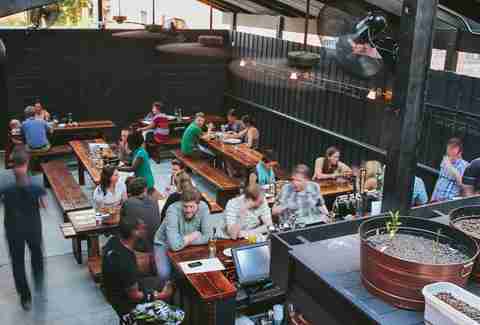 Another unpretentious option for outdoor imbibing is the roof at 1905. It’s a sharp contrast from the medieval/church/French thing the dining room has going on. 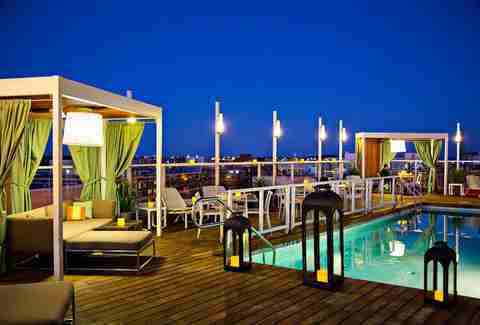 So head on up for bar snacks and libations in a more modern setting where you can see the Washington Monument. The beer selection shouldn’t disappoint you. Sidewalk seating on Rhode Island Ave, a simple menu that caps off at $16, and a whole lot of whiskey make Boundary Stone a good outdoor option in up-and-coming Bloomingdale. Their chili cheese half smoke is miles ahead of Ben’s Chili Bowl and the Bacon (Jam) Burger is banging. Take your time going through their 100+ whiskey list. Founding Farmer’s waterfront friend is the best place to drink outside in G-town thanks to its never-ending supply of tiki drinks. Scorpion bowls? Check. Mai Tais? Check. Daquiris? Check. And then some. The drink list is almost as long as the something-for-everyone food menu, and that’s saying something. So pull up a sidewalk seat and go on a brief vacation. 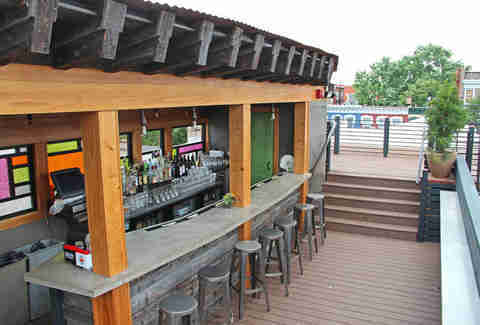 They have two patios and just completed some renovations that debuted this month -- like adding a TV for starters. Visit on Wednesdays when you can get a 22oz bottle of Goose Island Matilda at half price. Or, go with what their name suggests and try one of six different whiskey flights. They also serve brunch 11:30am-4pm on the weekend.